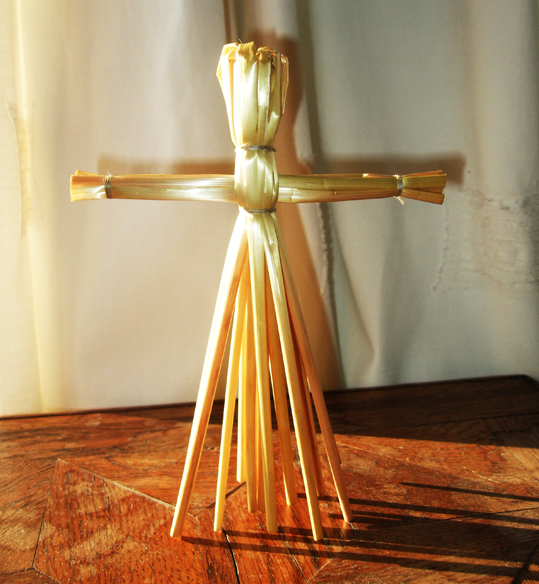 After making a Brigid's cross for Imbolc, I decided to use the leftover straws to make a Brigid doll. In some parts of Ireland and Scotland it is traditional to parade a doll representing St Brigid around the town on January 31, which is the eve of St Brigid's Feast Day. This doll is then given place of honour while everyone taking part in the festivities has a bit of a party, then she is put to bed before being greeted again in the morning. According to folklore, this would bring blessings upon the household for the coming year, and clothes left by the doll overnight would also be blessed to help protect those who wore them. For Pagans, the goddess Brigid is celebrated in a similar way - although most pagans I know parade the Brigid doll around their house rather than around the town, then put her on their altar and light a candle to honour her. The doll, which is known as a Brídeóg (also called a 'Breedhoge' or 'Biddy'), is often made from rushes, reeds or straw and is dressed in white cloth, shells or flowers. For many pagans Brigid is the bride of spring. Her arrival at the festival of Imbolc coincides with the first signs of green shoots growing in the soil and perhaps a few snowdrops starting to bloom. I made the doll in the photo above by adapting the instructions I found on the Colorful Crafts website, but there are many other ways of making a Brigid doll that you can find online or in books. The basic instructions for the one I made are relatively easy. Soak a bundle of straws in water so they become pliable. Take a bunch of them and tie string or cotton a couple of centimetres from one end, then fold the long ends of the straw over the tied section to form a neat head. Tie more string or cotton around the straw where the neck would be. Take a few straws and push them through the doll to form the arms, then tie string or cotton underneath the arms to hold them in place and to help the remaining straws splay out to look like a skirt. Form the hands by tying string or cotton where the wrists would be, then trim the straws to the length you desire. You can adorn the Brigid doll with seasonal flowers or dress her in white fabric. My Brigid doll will be going on my own Imbolc altar along with my Brigid's cross and a candle carrying Brigid's sacred flame. Additional note: Since I originally wrote this post, my Brigid doll has appeared on the front cover of my own book Pagan Portals - Poppets and Magical Dolls, which covers a variety of dolls for seasonal celebrations.